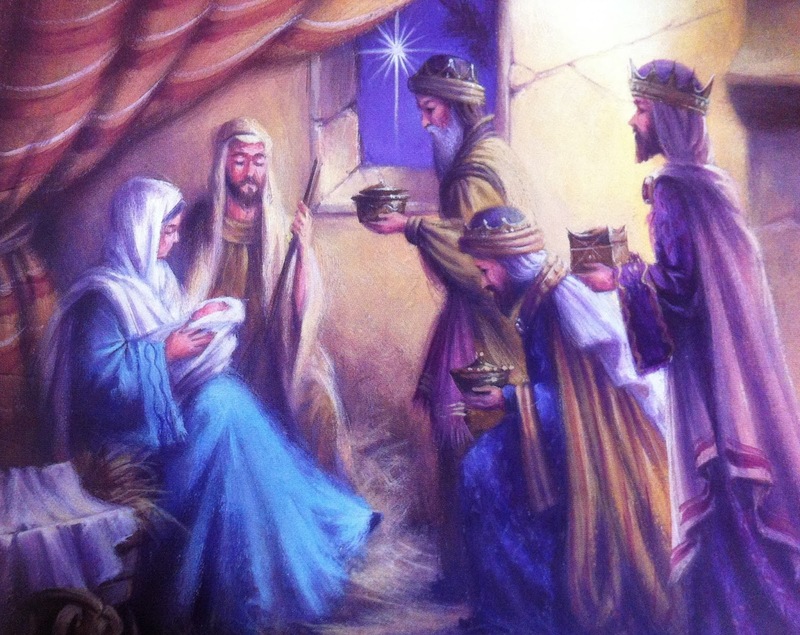 6th January, Epiphany, is the day we remember when the Magi (Wise Men, Three Kings) visited Jesus, Mary and Joseph. There are many thoughts on how old Jesus was when this visit occurred. One thing we do know for sure is that it wasn't on the night of his birth and even though the Magi are usually depicted in any Nativity scene, he was probably between one and nine months old. Some even say two years. Matthew's Gospel gives the only account of the Magi's visit and King Herod's wrath causing him to order that all male children under two be killed. As Jesus was Jewish he would have been circumcised when he was eight days old, (Luke 2:21) not necessarily in the temple, but at the house where they were staying. House, not stable - there lies another story. Mary and Joseph probably wanted to stay with relatives when they went to Bethlehem (David's town) to register, but as the town was so crowded, they would have had to sleep in the stable area, under the house. Jesus would have been taken to the Temple thirty-three days later after the "days of purification" were completed, which is the 40th day after Jesus was born. (Leviticus 12:2-6 & Luke 2:22-38). We don't know for sure how old Jesus was; Matthew's Gospel refers to him as a child, not baby, but we know the Magi followed a star, which at the time was not out of the ordinary to the untrained eye. Only they, who studied the stars, would have noticed it and recognised it as having special relevance. Divide the pastry in two parts; roll each out into a circle about 9in/23cm across and put one circle on to a baking tray. Beat the egg and remove a small amount for glazing. Mix in the almonds, sugar and butter until you have a smooth paste. Spread the paste over the pastry on the baking sheet leaving about half-an-inch round the edge uncovered. Pop a bean, or coin, or small figure into the paste, wet the edge and lay the second circle on top. You can make a pattern on the top or just leave it plain. Glaze with the remaining egg yolk and pop into the oven for about 30 minutes until crisp and golden. Serve warm with cream (I like whipped cream best - or clotted even better) or ice-cream. Whoever finds the bean or coin it in their slice will be king or queen for the night.